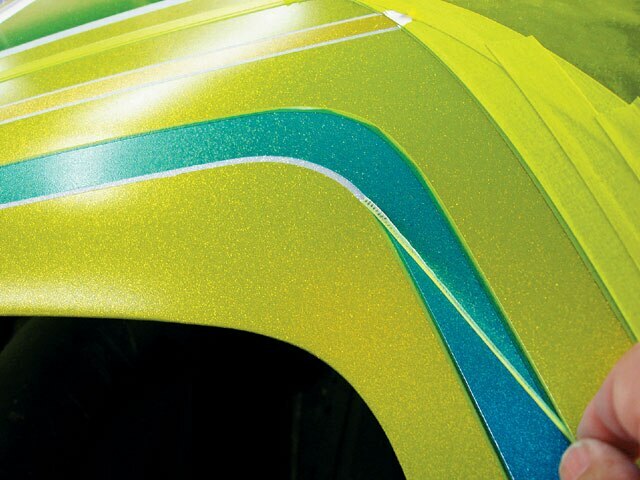 Apply Classic Lowrider-Style Graphics With A Modern Twist. 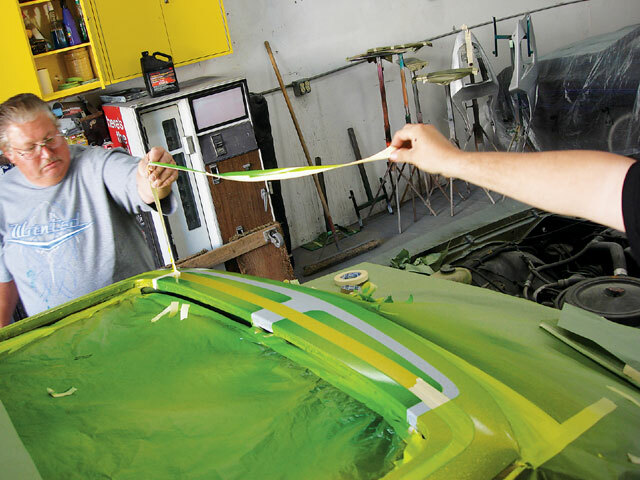 It seems that everything goes in circles, from retro-look clothing to custom paint styles from back in the day. We’ve been receiving emails from different readers asking us if we could do a tech on old school graphics. 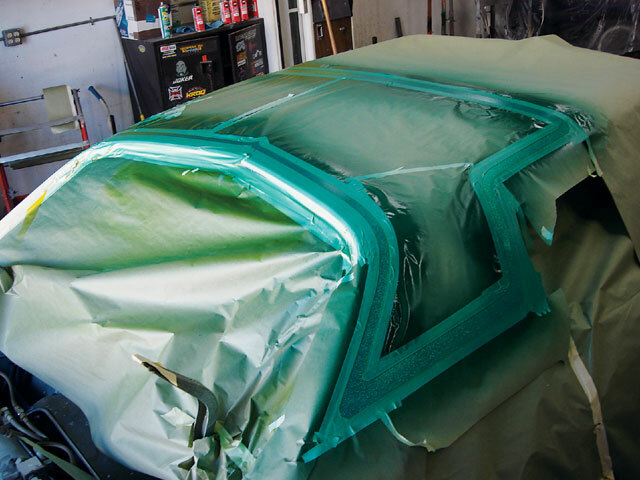 So we asked around and hooked up with a Danny of D&D Designs in Baldwin Park, California, who had the perfect project planned with a customer’s car. 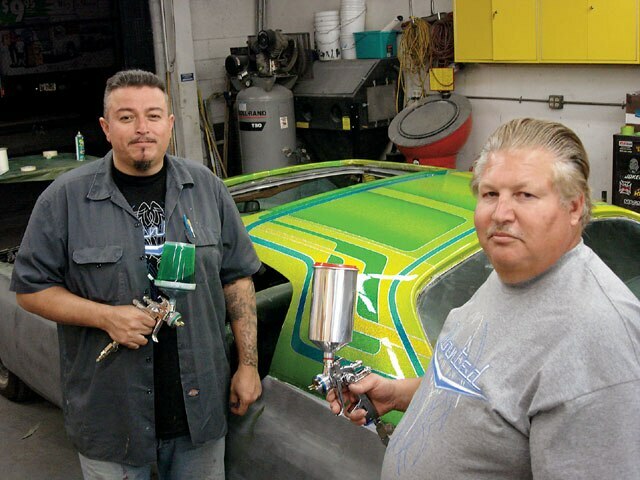 Danny teamed up with his buddy Sorell, who used to do old school paint jobs when they were cool the first time around, and Ron from SEM Paints, who was going to come in and lend a helping hand. We scheduled a date with them and were on our way. 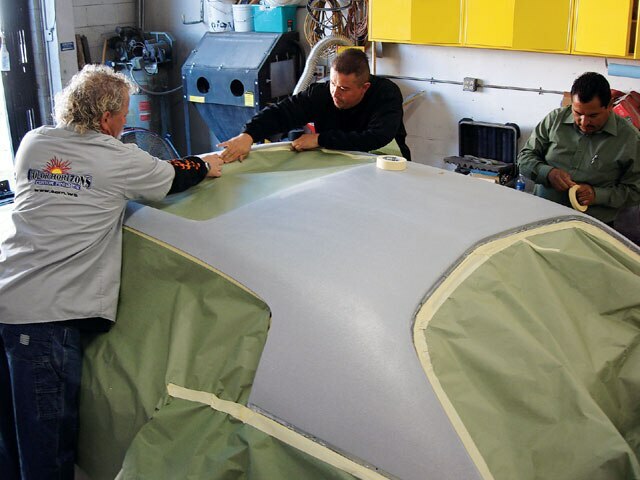 When we arrived, the car was just about ready to be shot with only a few details needing to be completed before the roof was started on. 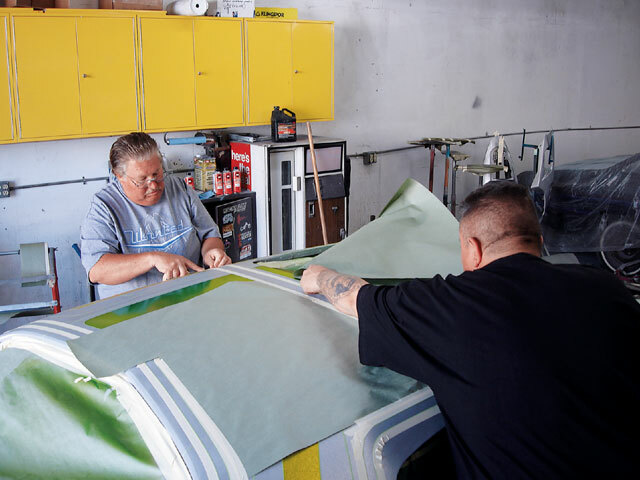 Once everything was in order, the project took off without a hitch, as they had determined the design before laying any color to make sure that the build-up could be done in a few days instead of weeks, as some projects go. Now follow along as Danny and Sorell show us how to do old school graphics with a modern twist. 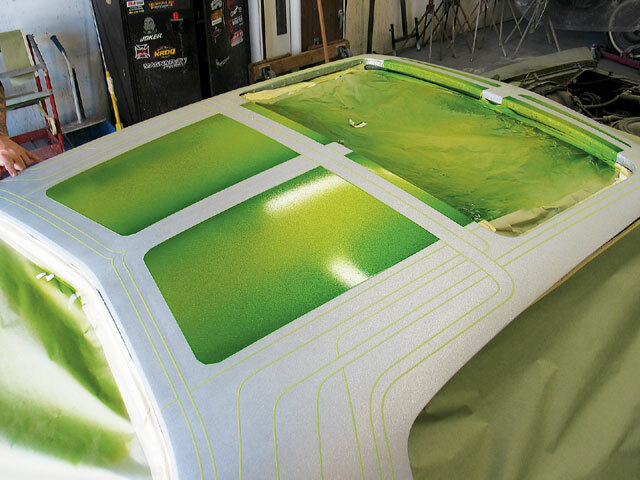 We used SEM’s Color Horizons line of products for this graphics piece. Ron helped us get the roof ready by wet sanding it and making sure that it was ready to be sealed. Sorell started by taping around the windows. 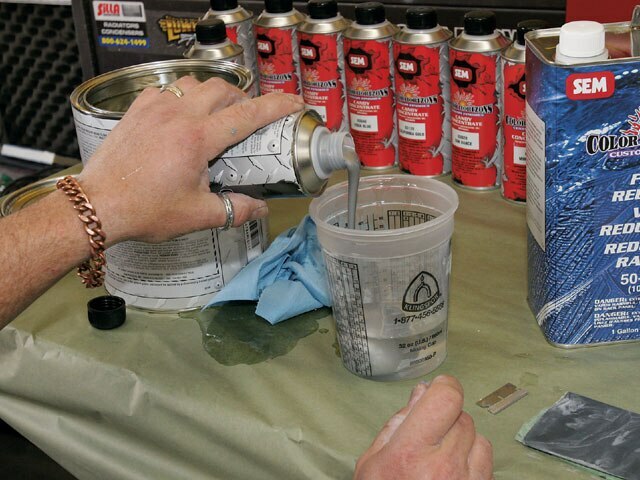 Ron from SEM Paints mixed the silver base. 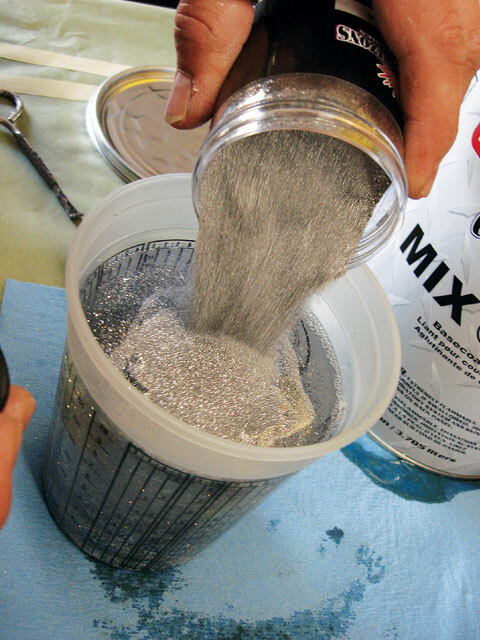 SEM mix clear will be used to hold the silver flake in place. A whole jar of SEM big flake was used for the top. The roof was blown dry to make sure that it could be masked off properly. 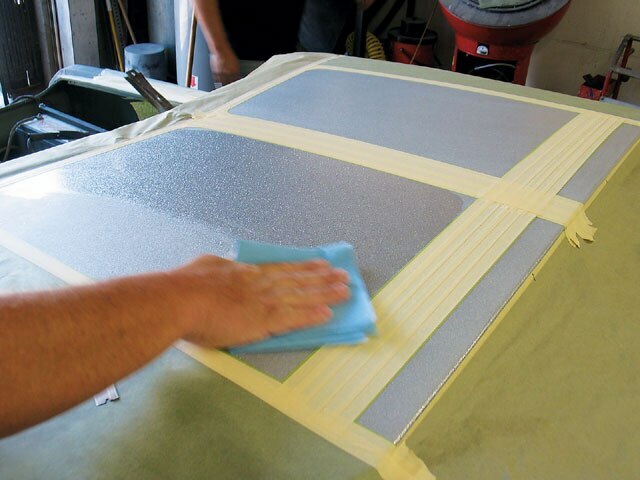 Taping and masking the car takes time, but this step should not be taken lightly as it will save time later when cleaning up. 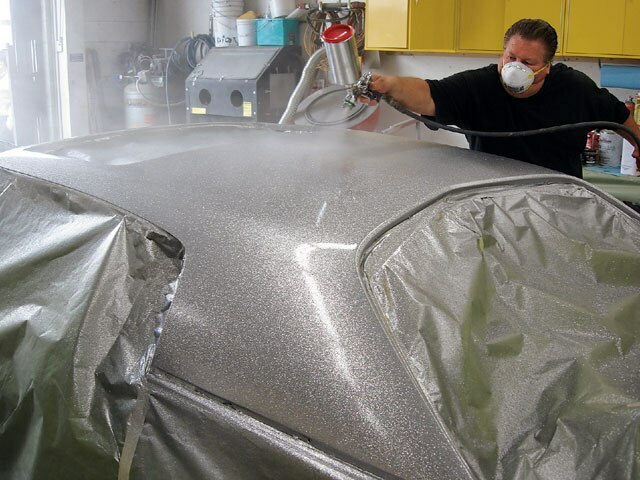 After the whole car was masked, it was ready to be basecoated. 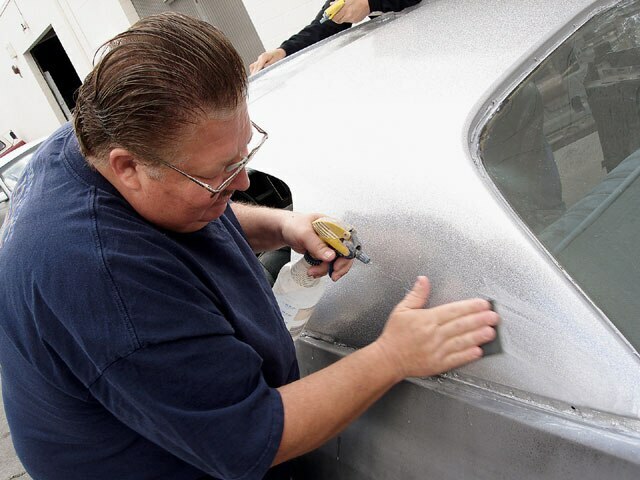 The sealed car was based in silver, which was used as the foundation for the rest of the colors that were going to be used. 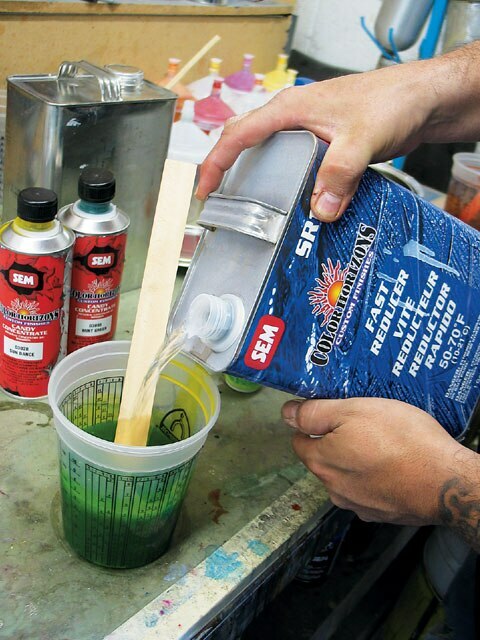 The flake needs to be mixed properly before it goes into the SATA paint gun. 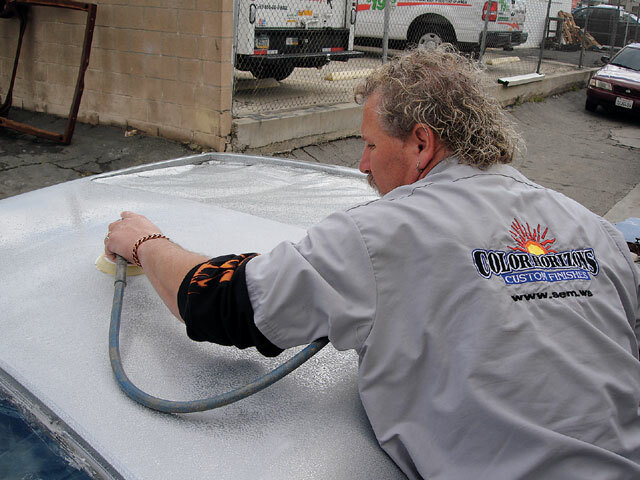 Danny started to shoot the flake from the center of the vehicle, covering the car in several passes. 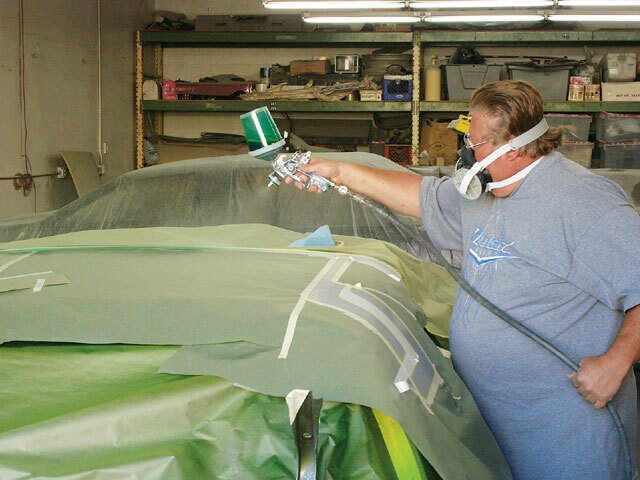 The car was allowed to dry for two days before the clear was “cut” with sandpaper. 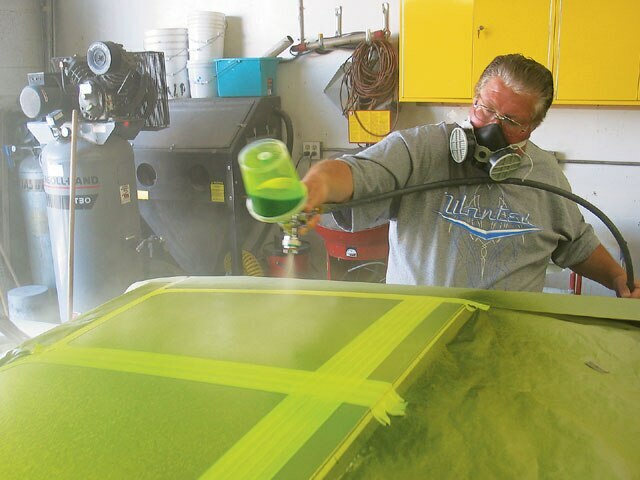 With years of experience, Ron used a DA sander to cut the clear and speed up the process. The roof was cleaned and blown to make sure that there was no dirt on the surface. Once the graphics were laid out on one side, template paper was used to duplicate the graphics on the other. 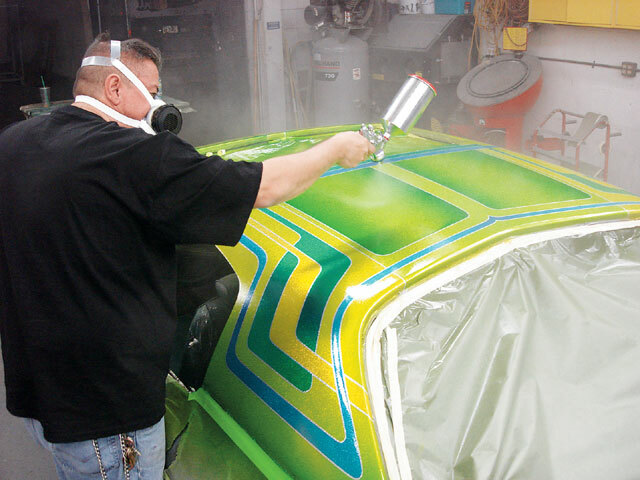 The graphics were numbered to see how many custom colors were going to be applied. 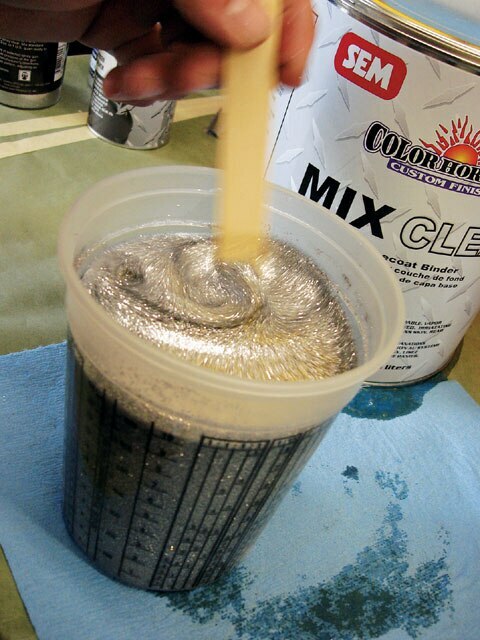 The laid-out flake was cleared to smooth the foundation and allow the colors to go on flat. 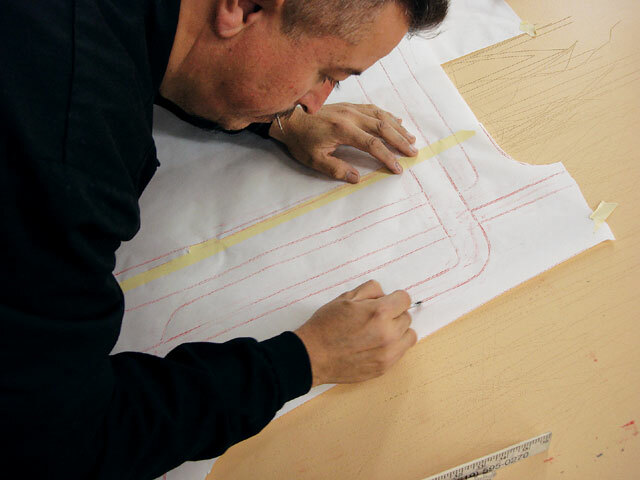 Sorell started laying out the designs using 11/44-inch tape. 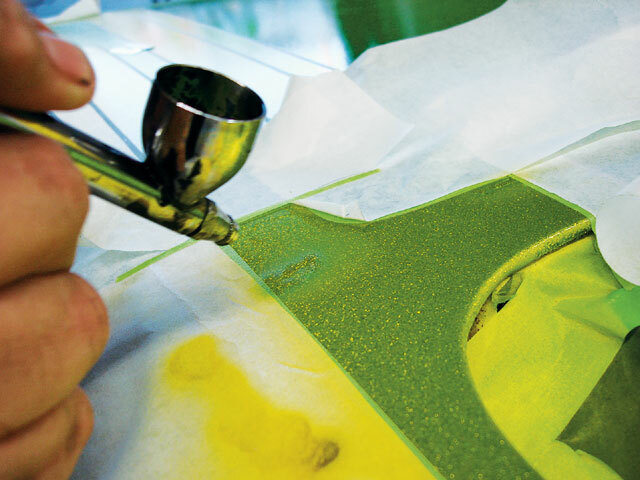 The stencil was then prepped with a line roller. 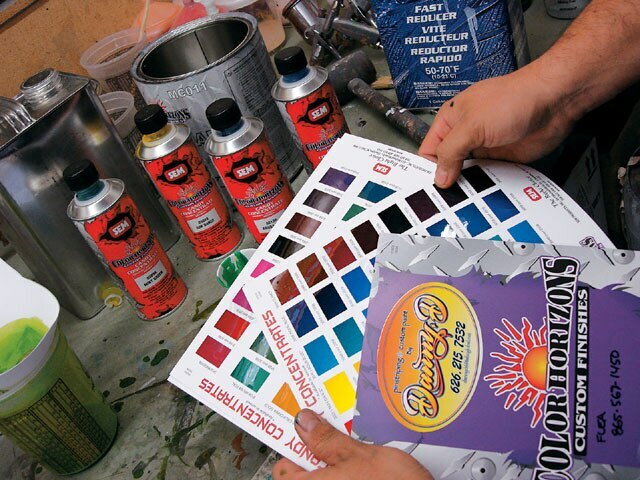 Danny went over the color selection using Color Horizons custom finish. Once the stencil was laid out, it was back to more taping on the roof. 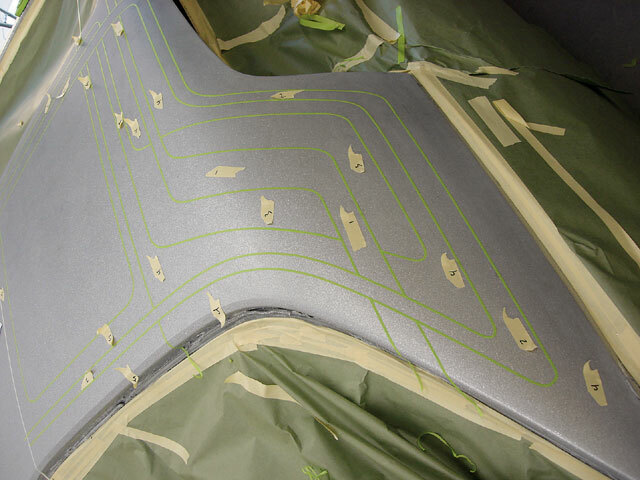 The panel was wiped down with wax and grease remover to help keep a clean finish and avoid any reactions. 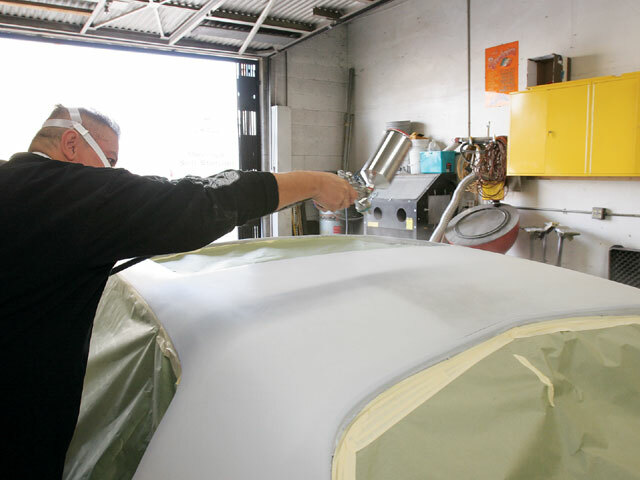 Once the desired color was achieved, it was reduced and ready to be sprayed. 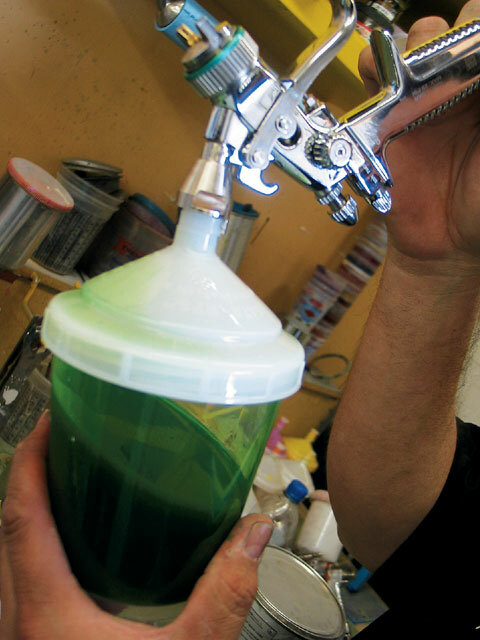 The SATA quick release system made it easier to change out colors and keep the project rolling. In this case, we were done using the first color and it was put away until the project was completed. 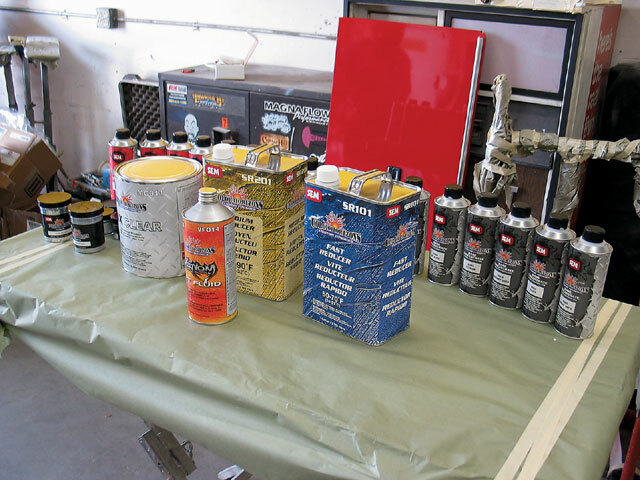 The tape was removed very carefully, making sure that no paint was removed accidentally. You can see the colors coming together. 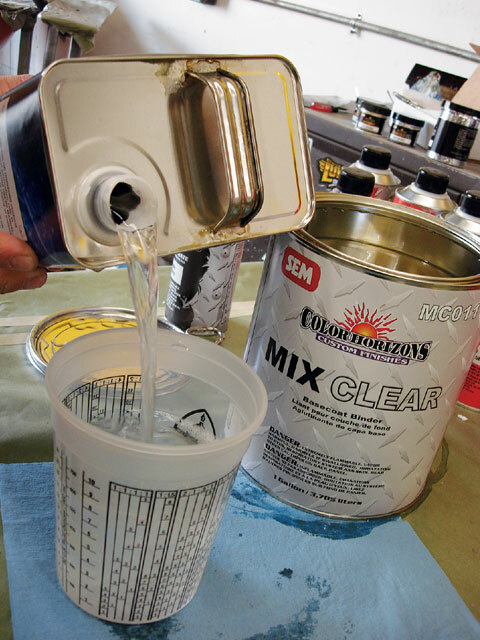 Here, the painters take a look at a color that would complement the combination being used. As mentioned earlier, you need to be careful when removing the tape; if it’s too wet, the paint can peel, as it did in two sections here. 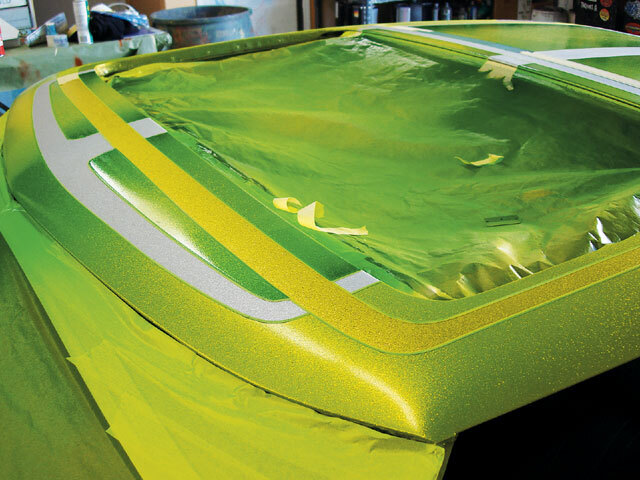 The first panels were dry and ready to be back masked to allow the next color to go on. 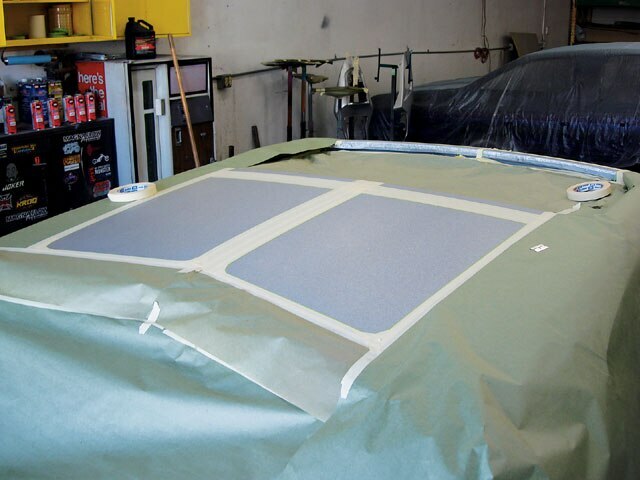 The painting duo back masked the panel and got the roof ready for the next color. Teal paint was added a few coats at a time. Sorell showed us that you should start painting from the top down. 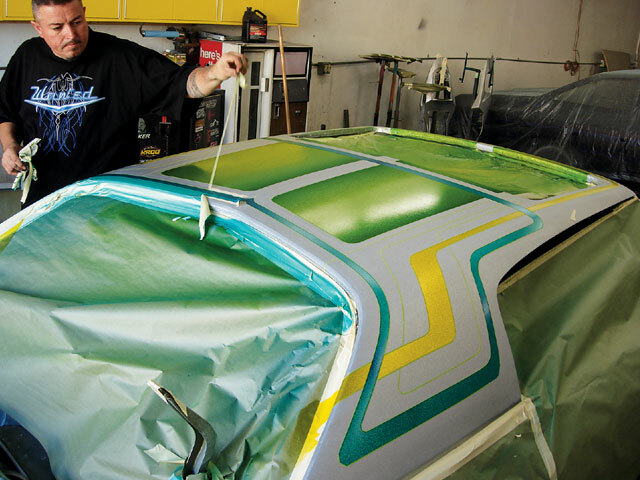 Once the last color was applied to the final panel, it was time to finish unmasking the roof. You know those SATA cups with the mixed colors? 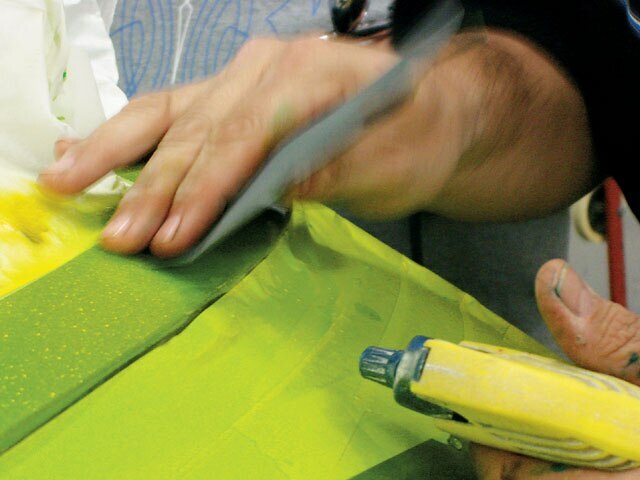 This is where they come in handy; the same colors were used to touch up those sections. 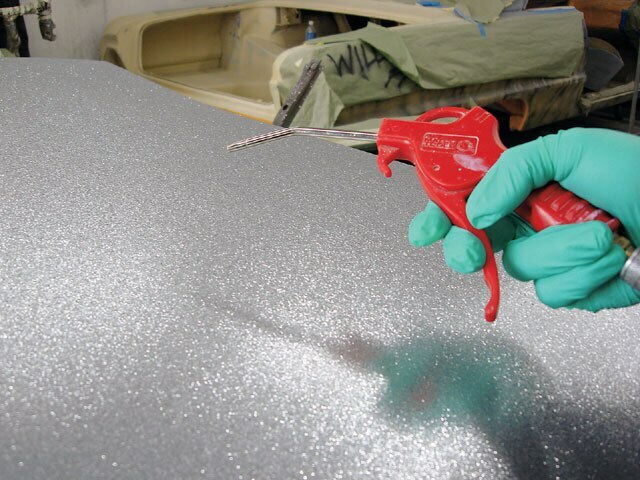 As you add more paint, the more careful you need to be when removing paint as you can peel your work right off of the vehicle. 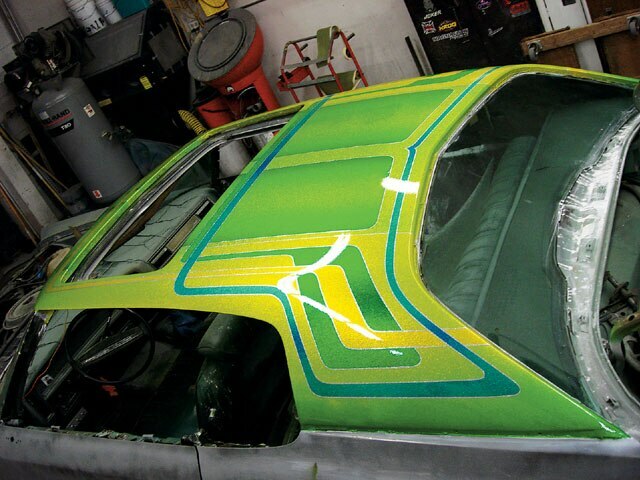 The old school trick of using tape to mask off part of the paint gave the roof a pinstripe effect. The final clear was put on in steps, like a build-up. All of the touch-ups melted right in with the final clear finish, giving this roof an old school look with a modern appeal.